Stamford, CT - The Loft Artists Association hosts their annual Open Studios event with special acknowledgement of their 40 years in Stamford’s South End. The event will take place at 575 Pacific St. in Stamford on Saturday, November 3, 12 to 5 PM and Sunday, November 4, 12 to 5 PM. “Our annual Open Studios highlights the LAA’s creativity and brings opportunities for the entire community to experience professional artists working in their studios and exhibiting artwork in state of the art galleries,” co-executive director, Mark Macrides says. “Come and explore our studios and galleries, meet our artists and get a rare glimpse into the life of a working artist in a collaborative and professional environment. Art collectors, dealers and anyone with an appreciation for high quality artwork will appreciate the opportunity to see the work of 40 diverse artists all in one location. Open Studios is a unique opportunity that brings the viewer and artist together in a way that differs from the typical gallery experience.” The LAA is proud to be presenting this event as part of a year-long series of events honoring the organization’s 40-year history. The Loft Artists Association currently celebrating its 40th anniversary, is a nonprofit organization dedicated to providing artists with a supportive environment and opportunities to exhibit their work in two state of the art, professional galleries. The LAA reaches out to the community at large with education and artistic expression, as well as collaborative projects. Since 1978, their grassroots events have attracted thousands of visitors throughout the tristate area and have been recognized by city and state funding agencies, as well as corporate and private sponsors. The LAA’s educational mission includes workshops and classes, artistic demonstrations and many opportunities for the community to see the creative process first hand. 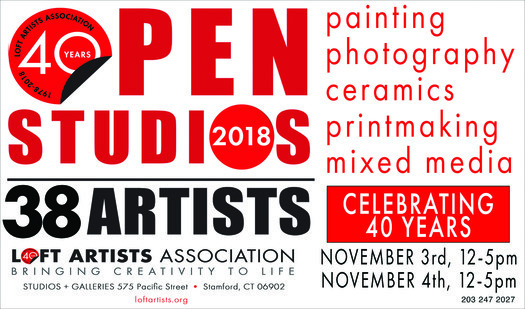 The Lofts Artists continue this great tradition by once again inviting the public to Open Studios 2018, one of Stamford’s premier art experiences. The gallery is open Saturdays and Sundays from 1 to 4:30 pm. Admission and parking are free. Handicapped access is available by request only. For directions and more information visit loftartists.org. Sponsored in part by The City of Stamford, Louis J. Kuriansky Foundation and Bob and Pat Phillips.